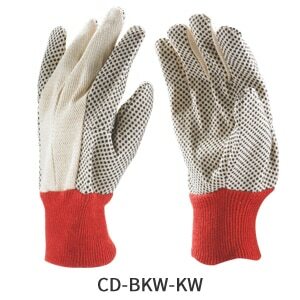 Feature Benefit Canvas Dotted Gloves are cut & sewn made from Natural Color Woven Cotton Fabric in different weights like 6 oz, 7oz, 8 oz, 10 oz, 12 oz & 14 oz for general purpose to heavy duty work. Higher the no of Oz, more the gloves thickness. These Gloves are breathable & optional inside raised fabric is more comfortable & absorbs the moisture. The Dots are on front side of the palm, thumb & finger & on back side of the Thumb, Index & small fingers. Knit Wrist for grip & also helps preventing debris to enter inside the glove. PVC Dots provide Grip to the user.